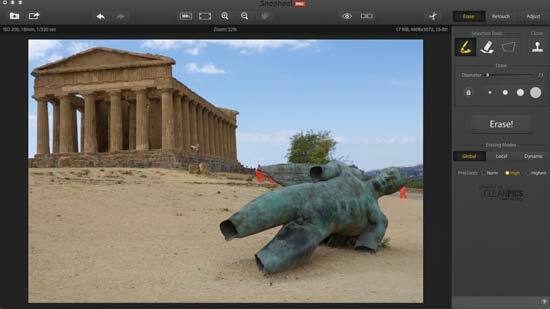 SnapHeal Pro is a new app developed by MacPhun for Mac users. Previously available as the standard SnapHeal version, the pro version is now available for £23.99. 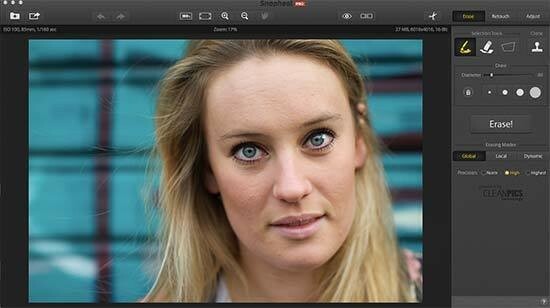 Unlike with the standard SnapHeal version, you can use it as a standalone app, or as a plugin to other Mac software including Photoshop CC, Photoshop Elements, Adobe Lightroom and Apple Aperture. 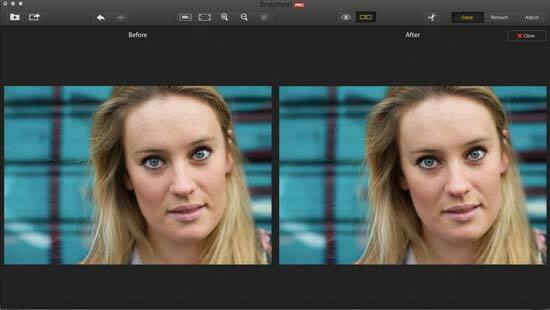 MacPhun claims that SnapHeal Pro features the “world's most advanced image healing algorithms”, which works to remove unwanted objects from your photos, as well as heal skin imperfections and otherwise fix your images. It's designed primarily for beginners, with MacPhun designing the interface to be very simple. 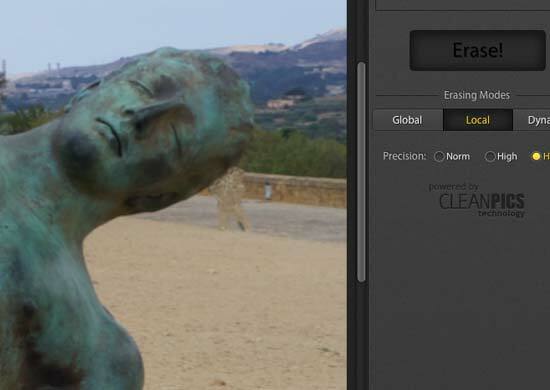 SnapHeal Pro uses a proprietary object removal technology called CleanPics technology and features different erasing modes which it claims gives you adjustable precision for perfect results. There's also the ability to perform other edits, including cropping and rotation, as well as those which affect the look of shots, such as exposure, saturation and clarity. 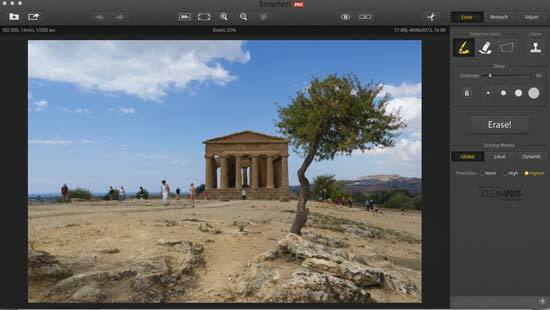 SnapHeal Pro is available as a download from the MacPhun site. You can try the software for free to find out if you will like it first, and this is something we'd recommend - especially if you're already the owner of another photo editing software, like Photoshop. Once you've downloaded the software you simply need to drag the icon into your applications folder on your Mac and you're ready to go. If you have purchased the software, you can input the activation code the first time you load the software, otherwise you can just tap the continue trial button. Every time you open the software, by default, you'll be shown some tips on how to use it - but you can switch this off once you've become more accustomed to it if you prefer. 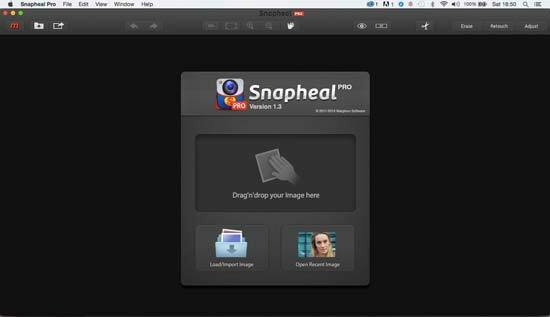 If you've got other image editing software installed on your Mac, such as Photoshop, at this point you'll be asked if you'd like install SnapHeal Pro as a plugin for those programs. 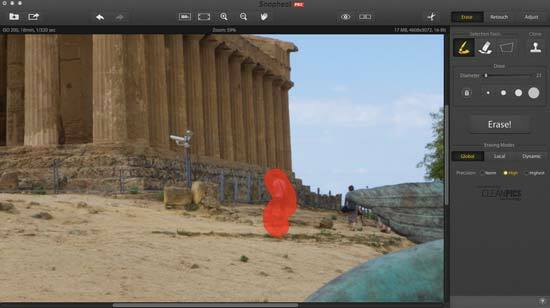 MacPhun has specifically designed SnapHeal Pro with amateur users in mind, and to that end, it's very easy to get to grips with and use. The company's website claims you only need around 10 minutes to learn how to use the software, and that seems about accurate. After you've got past the software's launch, you'll be presented with three options. To drag a photo onto a window to open it, to browse to a folder to select an image, or to open an image you've recently been working on. The software can open raw files, including proprietary formats such as Nikon's NEF as well as the universal DNG format. It can also open other types of image files, such as JPEGs and TIFFs. Once your file is open, you'll see there's not a huge amount of different options to choose from, which is what makes it so simple to get to grips with. On the right hand side of the window you'll find three different tabs; Erase, Retouch and Adjust. The first tab is probably where you will spend most of your time, since this app is primarily about removing unwanted objects from your shots. There are three different selection tools. If you choose the paintbrush tool, you simply draw on the image where you want to delete something (you can also paint over multiple objects). You can change the diameter of the brush using the slider underneath the selection tools. Alternatively, you can use the lasso tool to draw around an object. If you want to remove some areas of a selection, you can select the erase tool to make fine adjustments to your selection. If you decide you want to unselect everything you've already brushed over, you simply click the trash icon next to the brush sizes. Once you're happy with your selection, you click the large “Erase!” button and wait for the software to do its work. It can take a little while, especially if you've selected a large area(s), but while you wait you'll be presented with some fun facts and trivia to keep you occupied. After this you'll be presented with the software's effort at removing your object. If you're not quite happy with how it's worked, you can choose one of the three different erasing modes (Global, Local, Dynamic), or the level of precision (Norm, High, Highest). 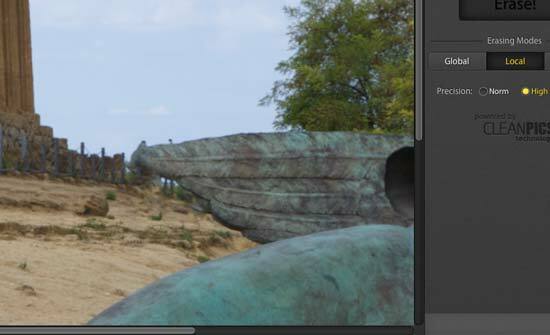 You can also use the Clone tool under this tab to sort out any rough edges which may have been left by the removal. If you've done any clone work before, such as in Adobe Photoshop, you'll be familiar with how this weeks, and again, it's quite a simple process. You simply hold down Option (Alt) button on your keyboard to select an area to clone from, and then brush along the area you need to smooth out. When you are cloning you can change the size of the brush, and also the softness of its edges and its level of opacity. Moving across to the Retouch tab, this allows you to apply specific changes to settings such as Saturation or Exposure to specific areas of the image. The Adjust tab allows you to make the same changes, but they will be applied to the whole image. At the top of the editing window you'll see a couple of useful buttons. There's one (an eye icon) which allows you to quickly see all the adjustments you've already made if you hold it down. 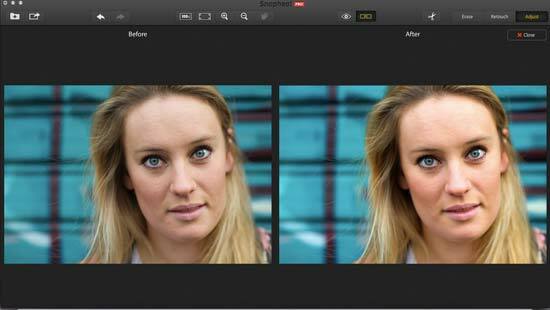 Another allows you to see your before and after image side by side. 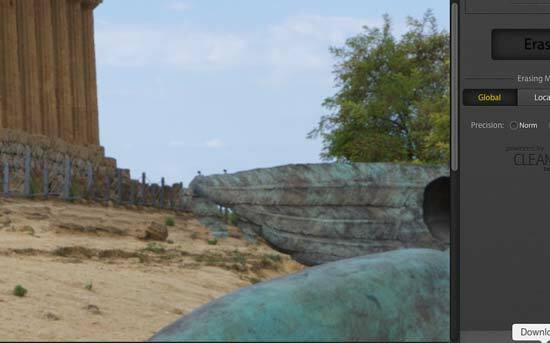 Click it once to see both images together, and again to go back to working on the shot. Once you're entirely happy with how everything looks, you can choose to save or export your saved image. You can save it as a number of different file types, including JPEG, or you can export it to a different piece of software such as Photoshop. You can also upload it directly to sites such as Flickr, Twitter and Facebook. If you're using the software as a plugin, it's a very similar process. 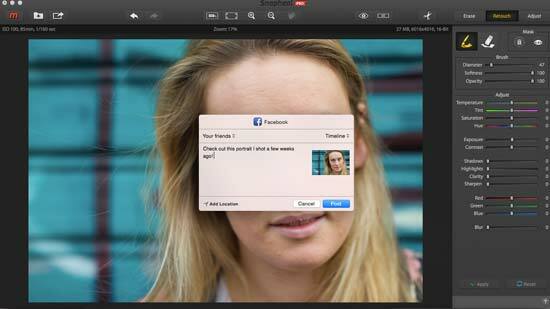 Say you're using PhotoShop CC, you simply go to Filter > MacPhun Software > SnapHeal Pro. 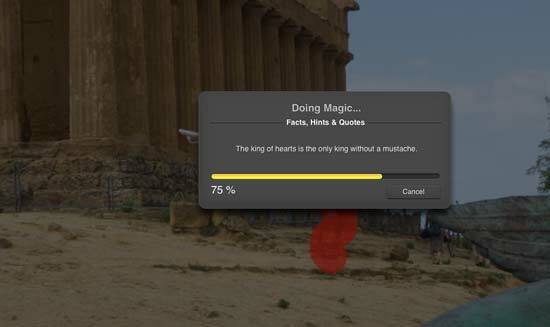 Once you click this, the SnapHeal editing software will open and you can make any changes or edits you want. Once you're done, click the tick icon at the top of the screen and your image will reappear, with the edits, back in the Photoshop window.